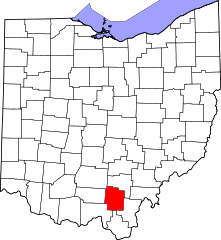 Jackson City School District in southern Ohio did the right thing by taking down a very prominent picture of Jesus in order to avoid losing a expensive lawsuit. The decision came when their insurance company refused to cover the expenses, if and when, the school lost the fights in the courts. The insurance company knew it was a losing case, but by blaming the insurance company, the school comes out looking like the victim against the deep pockets of the ACLU and FFRF. Of course, this is nonsense. Neither side has deep pockets. Both the ACLU and FFRF file lawsuits that they generally know they will win, if brought to trial. If they consistently lost, they would be out business. The reason they win is that they understand the Constitution and what are appropriate Constitutional limits. Look at the picture below. Does it look like you have just walked into a public school or a Catholic school? If you say the latter, then something is wrong. Very wrong. How did the Superintendent Phil Howard react? This is a perfect teaching moment. Of course, it will be wasted once again and instead replaced by the “Christian as victim” byline that has become all too common in these stories. And, that is the real shame ’bout Jackson, ever since the fire went out. This entry was posted in Current Events, politics and tagged ffrf. Bookmark the permalink.